This session you decided to take on Splug the Goblin as a minion. Mathos keeps a close eye on him and was given permission to make him into a hat, if the group thinks Splug is trying to betray them. Splug was helpful in describing the dungeon as the best as he knows. Splug was helpful in carrying things and doing chores for the group. One thing you discovered is that Splug loves to eat rat. When in the Goblin Chiefs rooms you discover some pickled rat in jars that Splug has taken with him. He offers to roast some and boasts he knows every way to cook rat. “You can barbecue it, boil it, broil it, bake it, saute it. Theress umm, rat-kabobs, rat creole, rat gumbo. Pan fried, deep fried, stir-fried. There’s pineapple rat, lemon rat, coconut rat, pepper rat, rat soup, rat stew, rat salad, rat and potatoes, rat burger, rat sandwich…” You cut him off at some point but you are convinced Splug loves to cook and eat rat. With the information Splug provides, you decide to enter after Balgron the Fat (Goblin Chief) through the secret door in his room. Mathos hears Balgron snoring and rushes in to hack at him with his axe. Mathos injurs Balgron badly but another squad member follows up to knock him out. Everyone then proceeds to work through fighting the other goblins in a very tight corridor fight. The group searches the rooms and finds 600 pieces of gold along some magical bracers that assist with healing. Quinn and Mathos question Balgron after healing him enough to gain consciousness. Balgron tells you the secret pass phrase to gain entrance to the second level, “And life fails in the dark.” He also tells you about the area with the zombies to the west, a tomb to the south of that and that the stairs to the next level are on the north end of that room. On the upper level there is the head priest of Orcus (Kalalrel). There are also some other priests of Orcus, undead and hobgoblins. Balgron also confirms the story about the Kruthik lair to the south east behind the barred doors. Upon sighting Splug, Balgron declares him a lazy spineless no-good and demands that he is locked up again. You all decide to knock Balgron unconscious again and flip the bed over before leaving him. After departing Balgrons rooms you went zombie hunting. The zombies did the best they could but the group quickly defeated them. There were wards on the ground which made the more difficult obstacle hoping around the room.Mathos accidentally stepped on one which caused him to run in fear from it for a turn. That’s about where we left off in the game for the evening. As mentioned… a letter from Kalalrel (Scion of Orcus) mentioned that when Orcus could enter the material plane that the village of Winterhaven would serve as food for his emerging armies. In addition three members of the Women’s Circle had visions confirming destruction to the village if someone didn’t stop the portal from opening and killing all the cultists of Orcus. They didn’t know why you were chosen but that you were the ones that needed to do the job. If you fail, you will likely not have a home to return to. You stopped the cult from getting an artifact but that seems to only be a delay to the plans. Goblins are small humanoid monsters. They vary in height from about 3 to 3 ½ feet (91 – 106 cm) and weigh 40 to 45 pounds (21 – 24 kg). They walk upright even though their arms nearly reach their knees. Their eyes vary from red to yellow and are usually dull and glazed. They have a broad nose that sits on a flat face with pointed ears and a wide mouth. Their mouth contains small, but sharp fangs. Their skin pigment ranges from a deep red through nearly any shade of orange to yellow. Members of the same tribe tend to have the same skin color. Based on their ability scores and the encumbrance rules the average goblin would be able to lift about 60 pounds over his head. The kruthik is somewhat hard to describe. It is insectoid, at least vaguely, despite having only four limbs. It has a long, thin body, roughly 3 or so feet long with a serrated spine, and its color ranges from grey, to black, to steel, to silver, to pale green, always with a shiny and metallic look. 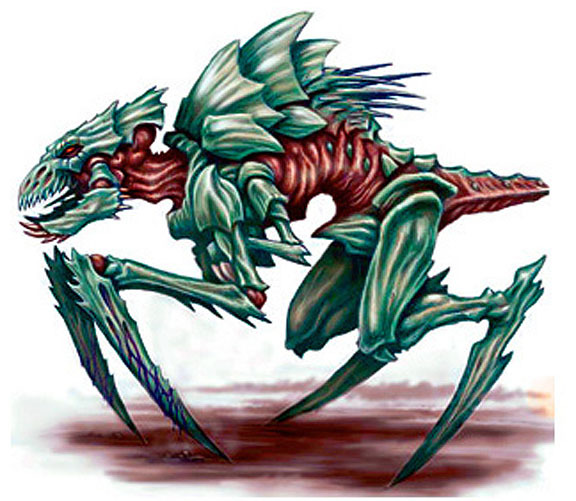 While the neck, sides and tail of the kruthik are bare, the legs, head and back are protected by spiny, jointed plates which eventually grow to protect the full body. In the unprotected parts of a kruthik’s body, organic lights of a color corresponding to that of the kruthik’s body glow. The kruthik has razor sharp teeth, and a pair of mandibles. In addition to its four major legs, the kruthik also has a much smaller pair of limbs hanging from its chest just a little back from the front two major ones. 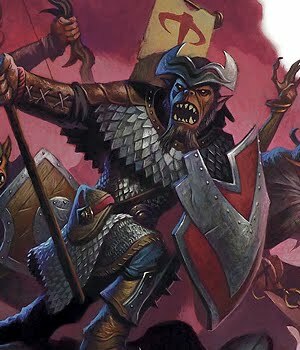 Hobgoblins resemble large, muscled humans, their bodies covered in coarse fur with red-brown or gray skin and red or orange faces. Large males have blue or red noses, and may have beards and male-pattern baldness. Hobgoblin eyes are dark brown or yellowish, and their teeth tend to be yellow. They are lean and tall, averaging six and a half feet in height and weighing around 200 pounds. Their muscles are designed more for agility than brute strength, and they have been described as having almost feline dexterity. They specialize in moving without sound. Hobgoblins can see in the dark up to 60 feet (18 m) away. Hobgoblins prefer blood-red garments with black-tinted leather. Their weapons are kept highly polished and in good repair. Many hobgoblins sport tattoos, deep scars gouged and burnt into their flesh meant to display their tolerance for pain rather than for art’s sake. 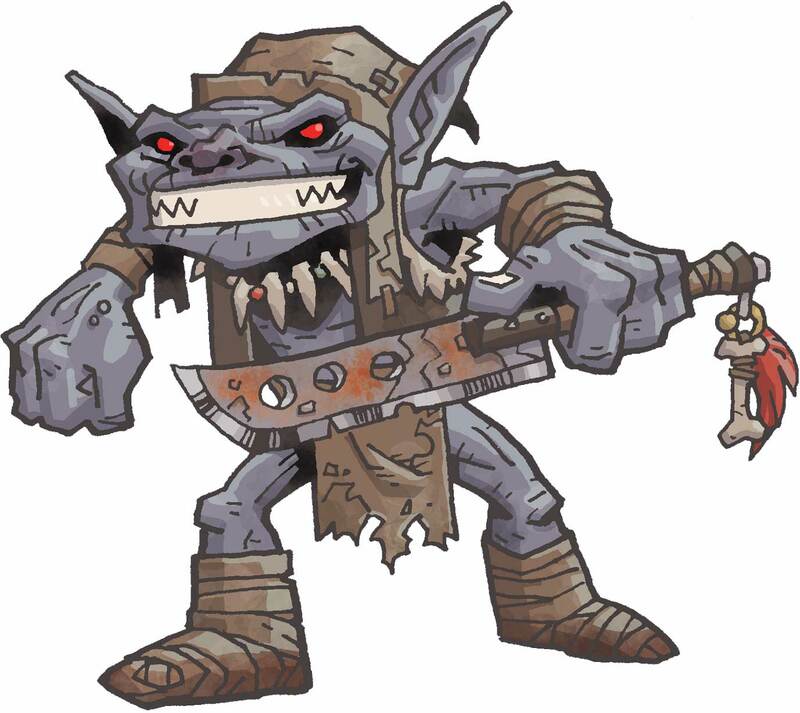 Some hobgoblins sport piercings for the same reason, though they always keep their noses unobstructed. Their hair is often braided with jewelry carved from the bones of slain enemies. Any other adornments worn are also meant to call attention to their endurance or battle prowess. Animals as well as humanoids can be turned into undead, most commonly a zombie. Undead are commonly immune to disease and poison. They are also resistant to necrotic damage and are vulnerable to radiant damage. I’ve decided to treat all zombies as having the critical hit (head shot) vulnerability just because it’s fun. The fourth edition Monster Manual describes Orcus as “one of the most powerful demons in the Abyss – powerful enough to threaten gods”. It describes him as a “foul and corpulent humanoid creature who has powerful goat legs and a desiccated head similar to that of a ram. His great wings stir up a reeking cloud of diseased air. He seems somewhere between life and death – his sore-ridden body suggests diseased life, but his head and glowing red eyes suggest undeath. His thick, spiny tail is in constant motion.” Aside from the Demon Lord of Undeath and the Demon Prince of the Undead, he also has the title of the Blood Lord.